When American company XPO Logistics acquired Norbert Dentressangle in 2015, it didn’t just get a fleet of red lorries. It also took charge of Tesco’s loose equipment fleet and its UK and Ireland estate of 12 recycling service units (RSUs) which manage the supermarket giant’s reverse logistics recycling operation. The Belfast RSU manages the recycling for 55 Tesco sites in Northern Ireland. With vehicles delivering to site 7 days a week, it’s essential that recycling plant is robust, reliable and easy to operate and maintain. It also needs to be able to withstand rising throughput volumes efficiently. To help process the plastic and cardboard packaging material throughputs, XPO’s Belfast RSU is now relying on a new Presona LP 85VH1 Series baler to provide continuous, energy efficient compaction. The custom-built baler was designed by the Presona UK team and incorporates a bespoke feeding conveyor, a stand-alone control panel giving online access to production and performance data, and a frequency control system to optimise energy consumption. Installed in February 2016, XPO’s new LP Series 85VH1 baler has a motor of 55kW, has a throughput of up to 12t/hr for cardboard and incorporates Presona’s prepress technology. When compared to a shear baler, the prepress delivers a significant reduction in energy costs as all of the power goes into the compaction process. And, because the process is more streamlined, the units suffer less wear and tear and emit less noise than their counterparts. The baler also minimises consumable waste. Typically, LP Series balers produce bales with a wire ‘pigtail’ length of just 50mm, significantly shorter than the norm. 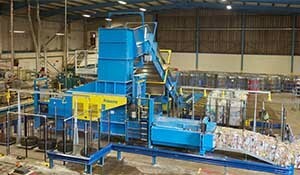 At XPO’s Belfast RSU, the baler will be compacting 9,500 tonnes of card and 700 tonnes of plastic a year. “The new Presona baler gives us options,” said XPO Belfast Site Manager Derek Payne. “There are Presona balers at work in other XPO sites and we know they’re reliable and robust. We can trust them to do the job day in and day out with little intervention. That’s important for us and will allow us to increase our operation further. “We also appreciate the on-site training, maintenance support and warranty supplied by Presona,” he said.